A major aircraft component manufacturer had contracts in hand for a large family of aircraft landing gear rods and cylinders. They had been making these parts for a number of years. The parts varied widely in geometry features. The customer needed to centralize an internal cross bore, located on two large external flats, and precisely linearly locate the end of the part for a combination turning, milling operation. The part setup prior to machining was very involved and labor intensive, requiring the use of a 4-jaw chuck, various pins, and .0001” dial indicators by which to manually adjust and clamp the parts into the closely held position for machining. 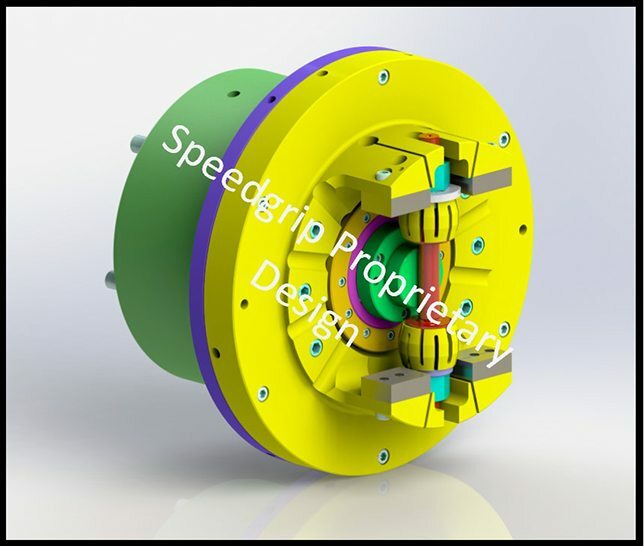 The manufacturing engineers of this large international corporation came to Speedgrip looking for a solution that would speed up the setup process. Our design engineers were able find an innovative answer to this challenge by using a 2 jaw diaphragm chuck with replaceable inserts, and a manually actuated double collet mandrel with standard off the shelf collets, which was installed into the part off the machine to reduce the part load time to under 5 minutes, compared to the previous process which took over an hour. The Speedgrip solution was quick, widely adaptable to different parts, precise, robust, and quite affordable, roughly half the cost of the other quotes this customer received. As a result, our customer was extremely satisfied. Give us a chance to help you improve your part processing. Increased accuracy, faster cycle times, and reduced tooling costs are ways we can help you improve your manufacturing operations. We look forward to being your trusted workholding partner. Would you like to be notified when a new blog post is published?